It seems so very simple, the concept of allowing and accepting any individual or culture's construct of understanding and expressing the divine, yet respect for religious differences and spiritual harmony have historically eluded humankind. We long for peace in the world, and wonder how we can "make it happen." Victoria sculptor Maarten Schaddelee, whose works in wood and stone often address themes of compassion, peace, and unity, has created an inspired installation entitled "Doorways to Spirit,"a large, colourful, architectural construction of16 full-size doors hinged together to form a circle, each depicting a different facet of the collective spiritual journey humans take: Christianity, Judaism, Islam, Buddhism, Baha'i, Hinduism, Taoism, Nature, First Peoples, Shinto, Goddess, Sikhism, Zoroastrianism, Confucianism, Jainism, and The Arts. Viewers are invited to walk around the structure, which cannot be physically entered. "The only way to pass through a door is spiritually, regardless of which door or doors you choose to 'go through,' the space in the centre is the 'Great Mystery', says Schaddelee. "I hope I have included everyone in some way, if not through faith, then through art. These doors must stand together, or they fall down; the most important message is respect of each other." The intricately detailed bas-relief doors are each hand-carved from a single piece of board, then painted and gold-leafed. 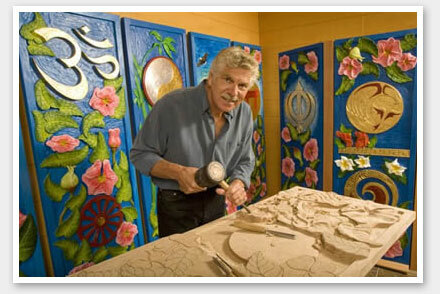 The brilliant colours are inspired by the artist's experience of art he encountered in the Mayan Riviera during a vacation there with his wife, Nadina, who says, " Each panel incorporates Nootka roses, which grow wild on our Gordon Head property where Maarten's studios and our home is located, and serve as a symbol of healing. The circle of Doorways, reminds us of a huge prayer wheel for peace, except it is people moving around them or sitting still with them that sets the intention of peace." This three and a half year labour of love was unveiled in Victoria in August 2007 and has been touring during the last year. If you would like to have "Doorways to Spirit" visit your community contact Nadina or Maarten at nadinas@telus.net or call 250-477-1651. Watch the creation of the "Doorways to Spirit" video. Read the "International Day of Peace" Press release.